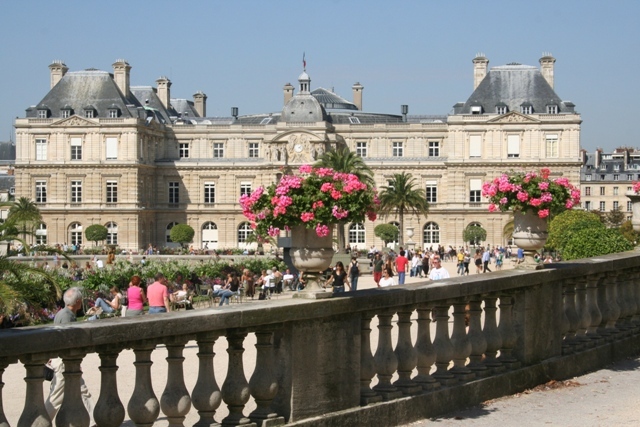 Where better than the Jardin du Luxembourg on a hot, sunny Sunday afternoon? For us it was the most perfect way to escape the city without actually having to leave. 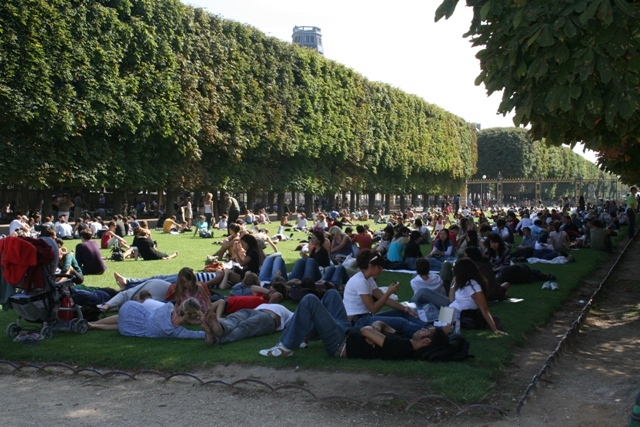 This is one of Paris’ most popular parks, forming a southern boundary to St Germain and the Latin Quarter. The Sorbonne University is nearby, what a fabulous place to come and relax after lectures. 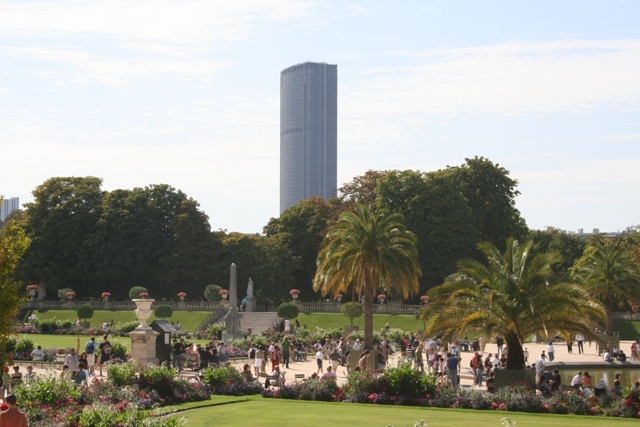 It is also a popular haunt of chic Montparnasse residents and their offspring who make use of the many children’s attractions. This was the sight that met us when we arrived. Sunbathers as far as the eye could see – far from the peaceful retreat I had envisioned. We did find other areas much less crowded than this however, so don’t let it put you off! It wasn’t all about soaking up the sun – we found numerous boules games in progress, joggers running along the shady paths and Parisian families spending time together in the great outdoors. 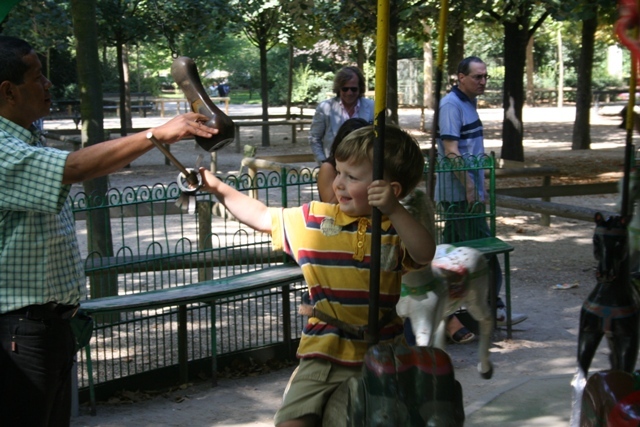 Son loved the park – children are certainly well catered for. A massive playground, fenced in and very safe made his day. They charged a small entrance fee per child and accompanying adult but you could come and go all day. Son did not hold much with this idea and wasted no time coming and going, staying put was his thing. We dragged him out after 2 hours. The gorgeous old-fashioned carousel ride was also a hit. Son mounted his trusty steed, armed himself with a stick and attempted to catch metal hoops on the way round. A simple but brilliant idea. Other things that made Son’s eyes light up were a puppet show, pony rides and the mini sailboats you could hire and sail on the lake. There are about 60 acres to explore with some of the most beautifully landscaped gardens in the city. They date from the 17th century, as well as flowers and lots of colour, there are statues galore, monuments and fountains. The landscaping is a mixture of French, Spanish and English styles and is a feast for the eyes. The focal point is a large octagonal pond encircled by stone urns and statues of French queens and other noblewomen. The pond is directly in front of the gorgeous Luxembourg Palace, built by Marie de Medici in the model of Palazzo Pitti in her native Florence. 5 hours later we left the Jardin du Luxembourg, a day of strolling, relaxing and (for Son) playing, running around and generally having a ball. This is the ideal spot to take a break from sightseeing and the ideal spot to feel like a local. Quintessential Paris with children, our whole family agreed there was no better place to spend a sunny, Sunday afternoon. Beautiful pictures 🙂 You got amazing weather! Thank you Sophie – the weather was overall pretty mixed but that day we were lucky with sunshine and blue skies! They must be a sturdy variety – we had some mixed weather during our trip! Beautifully written up and lovely images too. I’ve been to Paris 3 times and still have not made it here or to Versailles! I need to go back! You should definitely go here if you make it back to Paris! I have never been to Versailles either but would love to go there – maybe next time! 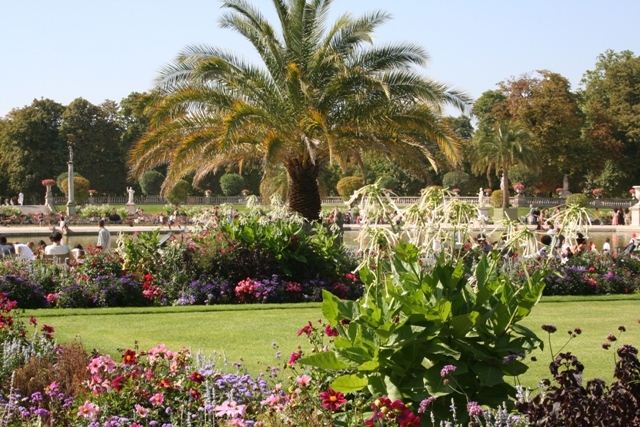 I live for the Jardin du Luxembourg- my favorite spot in Paris……great shots and I’m glad you had a fun family day there. It really is lovely and a great place to visit with kids – I had never been before on previous trips to Paris, now it will be on my must-go list when we are back! That’s definitely a big crowd of sunbathers! I’ve heard this place is especially good for kids, though. We have a picture book about the mini sailboats. It’s super for kids – really relaxing and fun. We have a book about the sailboats too – maybe the same one!! Beautiful pics! There are so many sunbathers!! Thank you! Yes a bit too many for my liking, but we did find some other less crowded places! I would love to visit this park and have a picnic with some cheese and champagne!!!! Cheese and champagne would make it the perfect picnic (in the most perfect setting too!). Looking at Joy’s Paris pics, I’m reminded that I should post mine, too. These are great! Useful information. Lucky me I found your website by accident, and I’m surprised why this twist of fate didn’t took place in advance! This post makes me miss Paris so much! Thanks for checking out my blog http://livingtoat.wordpress.com/ – I was hoping you would have a post on Greece since I am headed there soon! Thanks for coming by here! Been to Greece but a very long time ago (unfortunately), looking forward to reading about your trip, maybe it’s time for me to go back again soon! Great post. The Luxembourg Garden was my son’s favorite place too when we were in Paris a couple years ago. He spent probably 4 hours playing chess with locals. I think it’s his favorite memory from our entire trip in Europe! It’s those kind of special experiences and interacting with the locals that make the best memories isn’t it Teri!